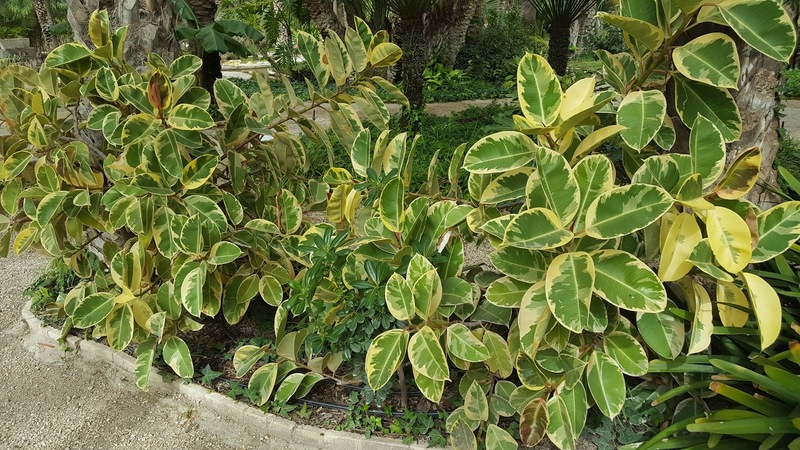 Commonly known as the 'Variegated Rubber Plant', Ficus elastica 'Variegata' is a highly ornamental foliage plant grown both as a house plant in temperate climates and as an outdoor specimen in mediterranean or subtropical gardens. It does not perform so well in the heat of tropical climates. There are of course many names variegated hybrids under cultivation, but for the purpose of this article they will be generalised under the 'variegated' cultivar name. 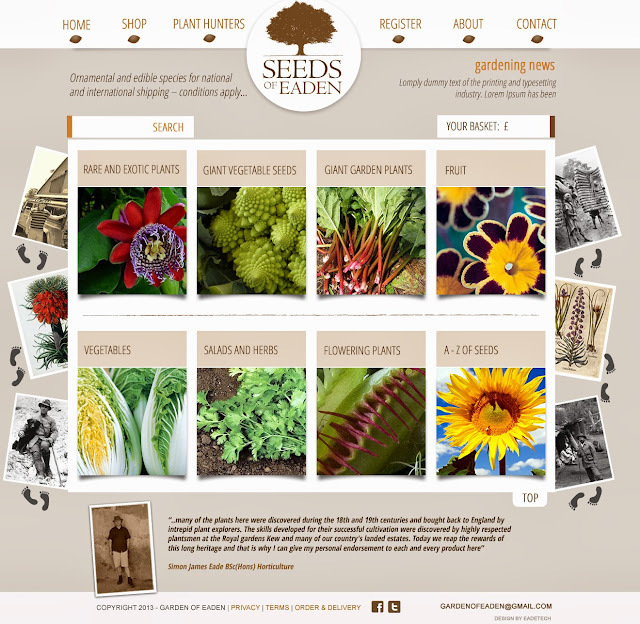 Two of the most popular forms are ‘Doescher’ which has yellow-variegated leaves and ‘Decora’ which produces broad, reddish-green leaves with ivory-colored veins running down center of each leaf. The original species is a large evergreen tree from within the banyan group of figs, and native to southeast Asia. It can be expected to grow to 30–40 metres, although sometimes taller in favourable climates. Thankfully the variegated forms are not as vigorous. 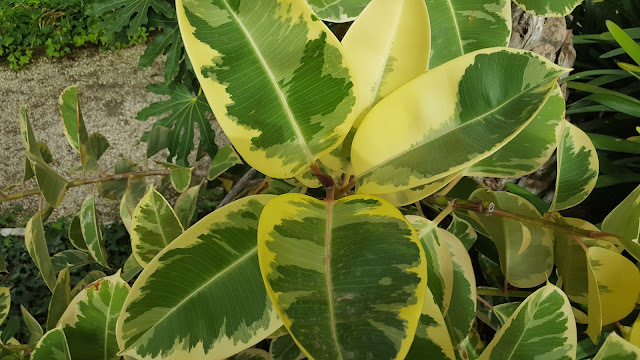 Ficus elastica 'Variegata' has characteristically thick, glossy leaves which can mature to between 10-30 cm long, Depending on the variety, height of between 30 cm and 3 metres can be expected. It can produce multiple trunks, attaining a spreading, irregular canopy once mature. To create a single-stemmed specimen remove any additional trunks early in the life of the tree and prune back the lateral branches so they remain smaller than half the diameter of the trunk. Be aware that in exposed conditions, branches left to grow unchecked have a tendency to break apart in high winds. You will be able to grow Ficus elastica 'Variegata' in full sun to partial- shade, and it has proven quite resilient on almost any well-drained soil. 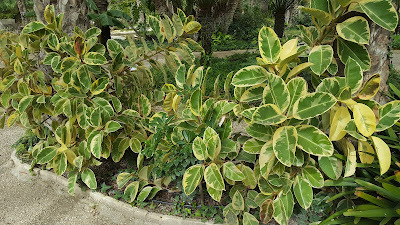 Once established, Ficus elastica 'Variegata' is surprisingly drought resistant. Container grown, houseplant specimens will perform well in a good quality, well-drained soil based compost. Position in a bright room but out of direct sunlight as the leaves can become scorched. Allow the compost to become fairly dry between waterings. Apply a liquid soluble fertilizer every week to two weeks during the growing season.